We left Nazareth today for Galilee. We hadn’t been in Nazareth as long as we were in Bethlehem, so there wasn’t the same sadness about it. And there’s an acute awareness that we are nearing the end of our journey. We began the day at Zippori, also known as Sepphoris, a Hellenistic Jewish city that predates the Romans. Much of what we saw was from Roman times: an aqueduct and cistern, a theater (now partially restored), a synagogue, plenty of 1st century ruins, cobblestone streets, and a variety of Roman-style mosaic floors. There was also the requisite Crusader-era presence, a watchtower on the hill, built in part from ruined Jewish sarcophagi. It was interesting to see Greco-Roman mythology on the floors of the synagogue, with the signs of the Zodiac alongside traditional Jewish symbolism. Zippori became an important Jewish cultural center after Jerusalem was destroyed in the Bar Kokhba Rebellion of 132. Our next stop was Kibbutz Levi, founded in 1949 by Orthodox Jews. Here, about 700 people hold everything in common and conduct several businesses. These include a fancy hotel, production of furniture for synagogues, and farming (dairy, beef, chickens, vegetables, and fruit). It seemed to be a good life, though our guide, Mordecai, lamented the loss of personal freedom associated with not having your own car and not owning your home. He also lamented that, because of protests from Jewish visitors, their hotel doesn’t hire Palestinians to work there. This caused several of our group to boycott lunch. It was also troubling to hear that both the Zippori archaeological site and the kibbutz were built where, until 1948, Palestinian villages stood. At Zippori, the introductory film noted that there had once been an Arab village there, but quickly switched to a view of the unoccupied ruins without mentioning the matter further. At the kibbutz, Mordecai told us that in 1949 when the kibbutz started (a year after the 1948 war), the hilltop was “abandoned except for stones.” That may be, but it hadn’t been abandoned long. This demonstrates an attitude we’ve seen more than once among the relatively few Israeli Jews we’ve met: they don’t know and don’t want to know. Our next stop was the Sea of Galilee, where we viewed a 1st century boat that was recovered from the muddy along the shore some years ago. The boat is housed at a museum at Kibbutz Ginosar, which is also the home to art collaborations between the kibbutz members and residents of local Palestinian villages expressing their collective desire for peace. Considering the attitudes we’ve experienced that morning, this was refreshing. 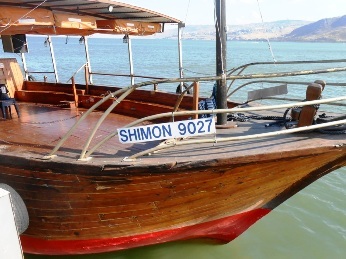 So was a ride on a (much more modern) boat on the Sea of Galilee. Most of us seemed to relax as we floated across the gentle waves and enjoyed the breeze. It was very soothing. We stopped out on the water and read Scripture and said prayers. We also looked up at Mount Arbel, the very spot from which we looked down yesterday. After a relaxing hour on the water, we got back on the bus and drove to a guest house on the Mount of Beatitudes, which is run by a Franciscan order called the Sisters of Beatitudes. This is easily the most comfortable place we’ve stayed, with comfortable beds, modern fixtures, and more room than we’ve seen for a while! We haven’t yet had time to wander the grounds and see the place where Jesus preached, but that’s on the agenda for tomorrow. I for one am greatly looking forward to it.